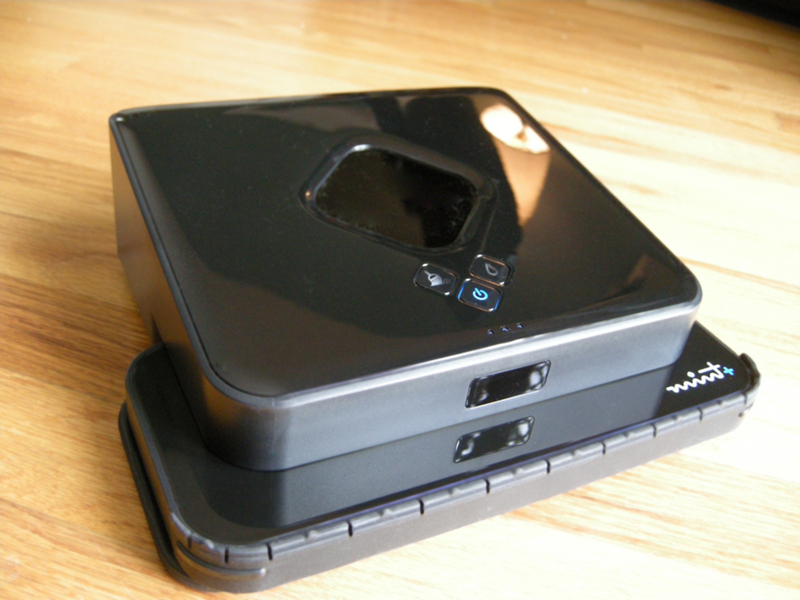 Later note – Announced August 22, 2013, iRobot is now selling the Mint 5200 re-branded as the Braava 380t. I bought the original Evolution Robotics Mint (model 4200) a year ago and I use it every week at home and love it. It’s really well designed and does a great job keeping our hardwood and tile floors clean. When I found out that Evolution Robotics was coming out with a new improved model, the Mint Plus (models 5200 and 5200C) I was really excited to see what they had done to improve this simple automatic sweeping and mopping robot. The good news is that they’ve really improved the robot, especially when it comes to mopping, and we whole-heartedly recommend spending the extra money to get the newer model. Very briefly, the Mint robot is built to sweep and mop floors. It comes with wet microfiber cloths for mopping and dry microfiber cloths for sweeping. When it sweeps, it runs around the floor in straight lines. When it mops it uses a back and forth and side-to-side motion to wet and then pick up dirt as it goes. Unlike Roombas, the Mint robots actually navigate around the room and keep track of where they’ve been. To navigate, they use a device called a NorthStar beacon which is a cube that you turn on and place on a table or counter in the room that the Mint is cleaning. The Mint cleans a room by going back and forth over the floor, and then running around the perimeter of the room. Like a Roomba, it has sensors to keep it from running off of cliffs and stairs. For a more in-depth review of the original Mint, check here. For a side-by-side comparison of the Mint robot to an iRobot Roomba, read here. The first thing I noticed when unboxing the Mint Plus, was that instead of using huge blocks of styrofoam to pack the robot, everything is in cardboard trays. I know not everybody cares about this, but for me it’s a big plus to have a company care about the environment and use “green” packing materials. The Mint cradle model (the 5200c) comes with a cradle. Otherwise, the cradle is available for purchase separately. 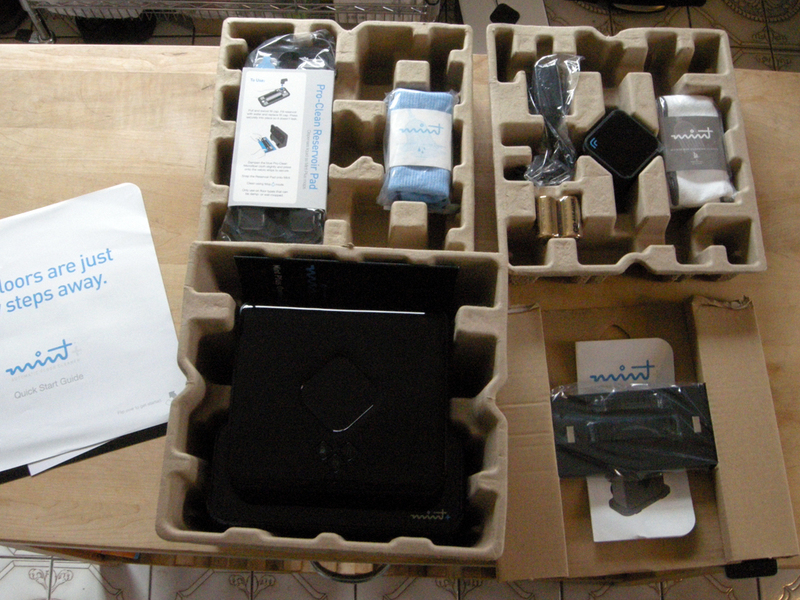 In the box you get everything you need to get started. Everything is very clearly marked, and many of the items are packed with simple instructions in the packaging wrapped around the item (like the Pro-Clean Reservoir) or printed directly on them (like the NorthStar module). 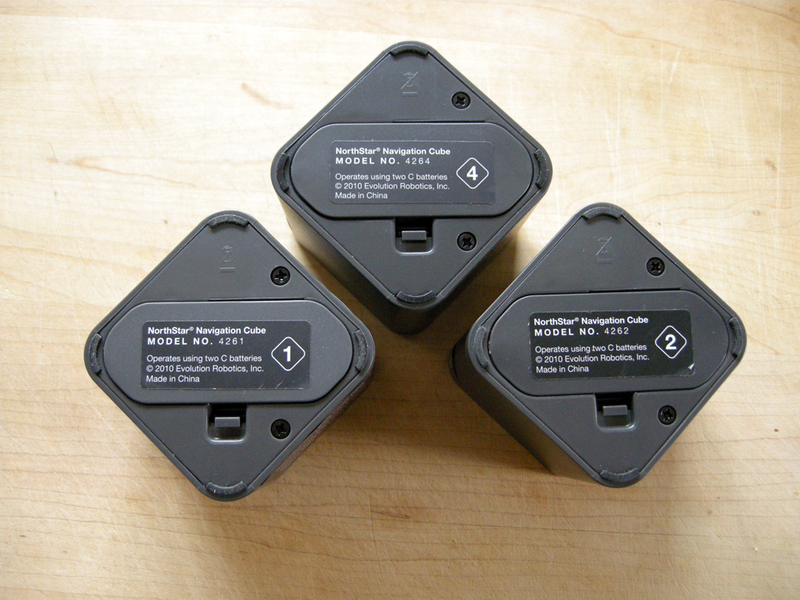 The NorthStar cube requires two C size batteries, and those are provided in the box, which is awesome. As you can see, the Mint Plus is black. Both robots are the same size and height. 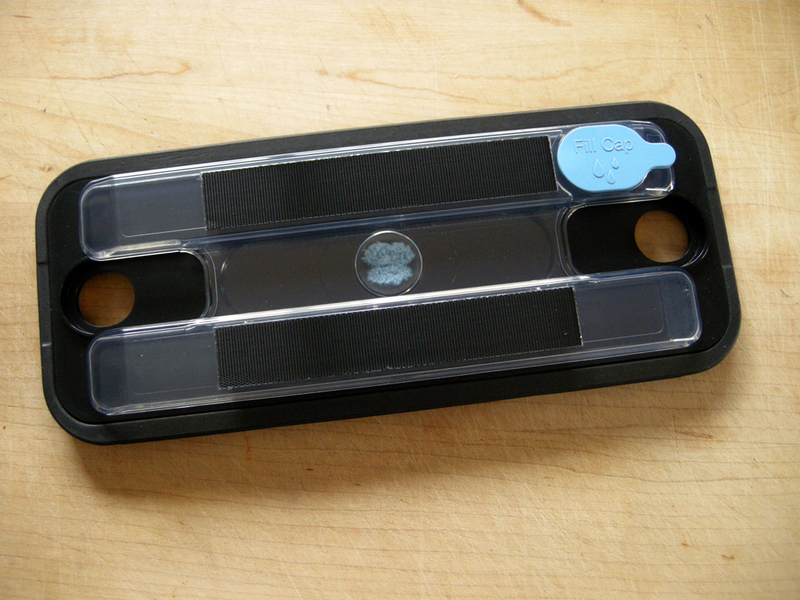 The Mint Plus comes with a cleaning pad that has a reservoir for dispensing liquid as it mops. The Mint Plus charges more quickly, getting a full charge in two hours. It also lasts 25% longer on a full charge than the original model. The NorthStar2 module is supposed to be more efficient and also has a better scheme for having the robot clean several rooms at one go. 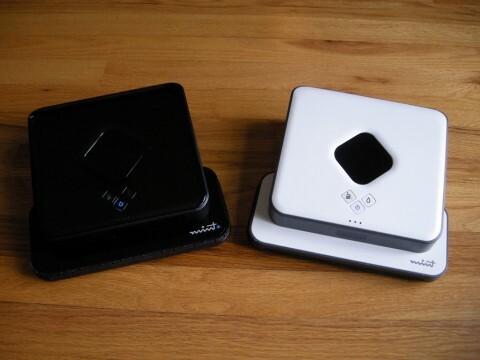 The Plus has a quick cleaning mode where it skips doing the perimeter. The Mint Plus also has a Pause and Resume feature where it can pick up from where it started if you need to interrupt it for some reason. 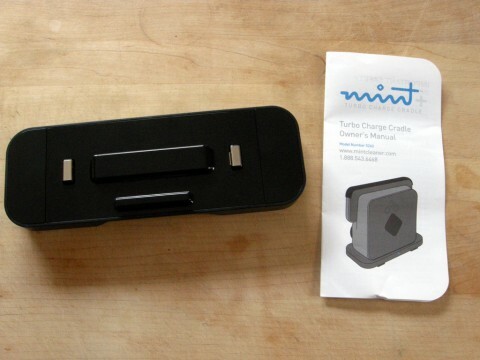 The Mint Plus is made so that it can be kept in a charging cradle. Looking at the Mint Plus, you can see that the front edge has more padding on it. There’s a rubber pad that runs all the way around the front. Like iRobot Roombas, the Mint robots will run into your furniture and walls. They try to slow down before they hit things, but people who use cleaning robots do tend to notice wear after using them for years. This padding is to help keep the robot from doing eventual damage to your things, and is much more substantial than the padding on the original Mint. Under the hood, the Mint Plus has an upgraded battery. Both robots come with a 7.2 Volt NiMH (nickel-metal hydride) battery, but whereas the original Mint came with a 1500 mAh battery, the Mint Plus is packing a 2000 mAh battery. The measure “mAh” is short for milli-Amp hours and is a measure of how much energy a battery can supply over a period of time. Do the math how you will, but the manufacturer states that Mint Plus has 25% more battery time. The connectors for the different batteries are not compatible, so you won’t be able to buy a replacement battery for one model and use it in the other. While the regular microfiber cleaning cloths are basically identical, the wet cleaning cloths for mopping are a little different. The cloths are a little smaller in the direction that gets tucked around the cleaning pad. This doesn’t reduce the cleaning surface at all, and was probably done to help keep the ends of the cloth from getting bunched into the middle and cause problems mounting the pad to the robot. The charging brick is built so it won’t block other power outlets around it. This is awesome! Evolution Robotics has made changes to the NorthStar Navigation Cube, which they are calling the NorthStar2. The original NorthStar cube was model 4261. Mint also sells a “second room” cube which is model 4262. The new Mint NorthStar module is model 4264 (which leaves me wondering what happened to 4263). The main change to the navigation system occurs when you get more than one cube and place them in different rooms. With the original system, the second cube would keep the robot out of the second room, and then when it was finished cleaning the first room, you had to pick the robot up and carry it into the second room. The new NorthStar system works such that the robot will clean the first room and then move into the second room by itself, afterwards. This makes better sense and doesn’t require human intervention to clean two rooms in one session. Also related to the NorthStar, the Mint Plus is supposed to navigate more efficiently. I timed both robots cleaning a few rooms, and for a room that took around 15 minutes to clean, the Plus took about a minute off of the cleaning time when sweeping. Watching the robots when sweeping, I don’t notice any real difference. The promotional literature about the Plus claims that the NorthStar makes the robot clean larger areas more efficiently, so maybe I need larger test areas. The Mint Plus is built with contacts on the back end to charge in a cradle. One nice thing about the cradle is that you don’t have to plug the robot in manually. With a cradle, there’s a space where the Mint “belongs” so it’s more likely to end up there. Also, it helps make the Mint fit into a way smaller space. If you’ve read my original Mint cleaner review, you’ll know that I wasn’t particularly impressed with the mopping job that that the robot did. 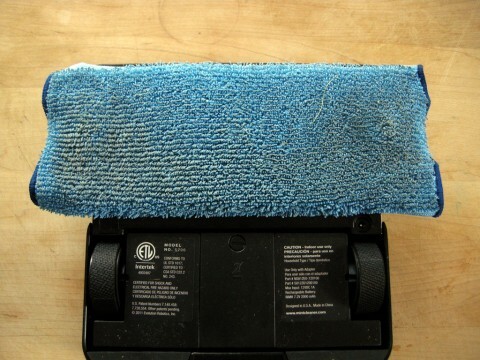 To mop, you wet a mopping cloth, put it on the cleaning pad, and then run the robot. The problem is that the mopping cloth usually dries out before the robot can finish the room. So it never cleans up all the sticky spots or places where there is mud tracked into the room. The engineers at Evolution must have known this was a problem because they’ve come up with a solution: The Pro-Clean Reservoir Pad. Basically, this is a pad that’s pretty much like the regular all-purpose pad that you attach the cleaning cloths to, except that it has a container for water (and mild soap if desired) and a wick that lets the liquid in the reservoir seep out into the cleaning pad. So the mopping cloth doesn’t dry out. As you can see from the picture, the reservoir is clear, so you can see what the water level is. Since we got the Mint Plus, we’ve used the mopping feature twice. Once to clean the kitchen floor after it hadn’t been mopped in a long time, and the second time just before we had company. On the first run, there were several spots where something sticky had been dropped on the floor and dirt had accumulated on the spots. These were the kinds of areas where the original Mint might or might not do a good job on them. We were pleased and surprised when these spots disappeared from one cleaning with no pre-wetting of the spots. The second time, we needed to clean because it had rained all day, and we had carried groceries and other things in and out of the house enough times that there was some mud tracked into the kitchen. Again, the Mint Plus did a great job where the original Mint might not have got everything. While it’s not as important with a Mint as it can be with its more noisy and obnoxious vacuum cleaning cousins, I really wish the Mint came with a scheduler. The rest of my complaints are really just minor quibbles. Here goes: While the cradle is nice, if it’s on the same floor as the robot is cleaning, the Mint will push it around the room. So you have to put the cradle somewhere else. Next, having two cleaning pads means that you need somewhere to store the one that currently isn’t on the robot (I told you these were quibbles!). Also, you have to remember to empty the Pro-Clean reservoir before putting it away because otherwise it will continue to leak water after you’ve put it away. 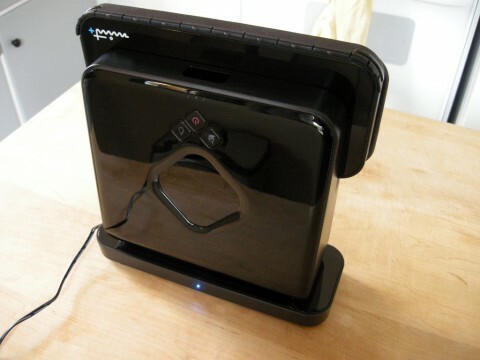 Finally, the glossy black finish on the Plus collects and shows fingerprints, dirt, and dust. A great little cleaning robot just got a lot better! While I would have really loved a scheduling feature on this robot, that’s my only really substantial complaint. 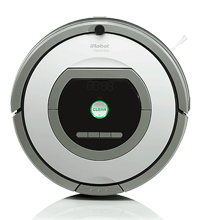 The robot charges more quickly, can clean more area on one charge, has some other features like Pause/Resume that make it easier to use, and it does a much better job of mopping. Also, the robot can be used with a cradle, which is really nice. As of this writing, the original Mint is $200 US, and the Mint Plus is $300 without the cradle. The cradle is about $70. If you’re wondering if a Mint robot is for you, consider whether or not a robot vacuum makes more sense. Our house is mostly hardwood floors with a tile floor in the kitchen and linoleum/marmoleum in the bathroom. For us, the Mint replaced our Roomba, and we love it. Someone with wall to wall carpeting throughout their house should consider how much they hate sweeping and mopping their kitchen and bathroom floors. So, is the Plus worth the heftier price tag? I would say that if you already have a Mint and it’s working great for you, the new model is worth it if you really want or need one or more of the substantial improvements, like the fast charging, the improved mopping, and/or the cradle. The same answer goes for someone trying to decide between getting the original 4200 or the Plus 5200. If you tend to get the deluxe model when you’re buying an appliance, it’s a no-brainer to get the Plus. Otherwise, you have to decide if the improvements are worth the extra cost. I didn’t expect to like the mopping feature as much as I did. I ran it just before some friends were coming over for dinner. I was preparing food while the robot was mopping the kitchen, and it “just worked”. To me, the satisfaction was worth it. When will be Mint plus available in Europe? According to the official Mint Cleaner Twitter feed, the Plus will be available in Europe “soon”. If you have a Twitter account, you can follow them @MintCleaner. I’ve had my Mint for a little over a year and LOVE it! My only complaint is having to change or re-wet the cloth when mopping. We live in a split level and the main floor (1,300 sq ft)is the kitchen, half-bath, pantry, laundry room, breakfast area, foyer, living room and dining room. The breakfast area, living room and dining room are all hardwood, with everything else being tile. That’s a lot of area to cover with one cloth so I usually have to re-wet or change it twice during the mopping. I consider that a small trade-off to manually mopping my floor. Other than that, it’s a winner! I won’t go out and buy the improved model right now. The main improvement for me would be the reservoir. However, if my current model gives out on me, I would probably get the newer model. How does the Mint Plus operate in hallways? Does it treat them like a seprate room? If so does that require additional cubes and do you need exrtas for each room? What about thresholds between rooms, will it cross them or do you have to manually left the Mint over them? The Mint Cleaner isn’t really aware of rooms or hallways. So it treats them all the same. If you start it in one room, it will progress into any other room in the house (as long as the other rooms aren’t carpeted). The thing is that it isn’t always able to see the Northstar in other rooms. This means that it will go into the other room and clean it, but it might not do as good a job in that room as it does on the room that you started it in. I usually block it into one room with a clothes hamper or something, so that it cleans one room at a time. When you have two Northstar cubes (with the Mint Plus only), it will do the first room first, and then progress to the room with the second Northstar, and it will clean both rooms equally as well. With the original Mint, the second cube only keeps it out of the other room. So can it cross thresholds? Otherwise it should be mentioned as a disadvantage. That’s a good point. It can cross most thresholds, but not high ones. It is fair to say that a Roomba or XV-11 will go over more thresholds than a Mint. At the same time, usually you want a robot to focus on one room at a time, so it doesn’t make that much of a difference with a Mint. How many different cubes can be used with the new model at once? In other words, if you had five rooms that needed cleaned, could you put 5 cubes so it would always know where it is and let it clean them in sequence? If I’m remembering correctly, the literature mentions that a person can use up to 3 cubes. I think that the cubes all have to be different. The tricky thing is that I don’t think they sell any more than 2 cubes… Hmmm. This might call for some experimentation. Hi, what a great review. I am putting in my requests for Christmas gifts and was thinking about requesting the 5200C. However, my living room (which has hardwood floors as well as a throw rug) and my kitchen (which has vinyl flooring) do not have a door between them. While I would love to have the mint clean both rooms, I actually mop them with different product. Therefore, would you suggest that I get a second cube? Thanks for all the really great info. Thanks for the kind words. You know, I have the second cube and find that I don’t use it, really. Usually I just want to clean one room at a time. What an excellent review. Your review was actually more indepth than the Mint website. You have me sold. actually the roomba does map. but it maps using the lighthouses. My only issue has been the Mint Plus not having a vacuum or any suction. If there is something dropped on the floor, it pushes it around, and when the Mint bumps a wall, it leaves the trash there. Otherwise, very handy cleaning tool! I find that to be the case with larger things, like pine needles. Although the Swiffer cloths seem to do a better job of grabbing things than the microfiber cloths that come with the Mint. I can’t say. It works on tile floors. I would guess that it wouldn’t work well on irregular slate, depending on how rough it is. My Mint 5200 leaves trace lines on the ceramic tile floor. I only use hot water; is there anything I can do to avoid these long marks on the floor?